The popularity of cut Cymbidium has recently spread from Asia to the United Statesand to the orchid community worldwide. 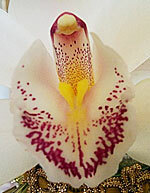 But these exquisite white orchids have been treasured in numerous societies for nearly two thousand years. 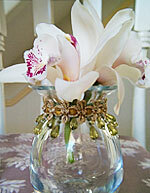 Despite the White Cymbidium’s diminutive size, orchid lovers are charmed by its fragrance and graceful form. Its scent is reminiscent apple blossom, with a slight hint of lily of the valley.Enjoy. 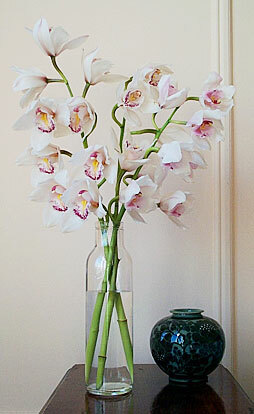 Orchids can be displayed individually or coordinated for a dramatic arrangement. Place stems in clean, warm water, and prepare to be amazed at how long they last. Cut Cymbidium have an average vase life of 3 to 5 weeks, and with proper care can retain their stunning looks even longer. Stems are approximately 2 to 3 feet tall, bearing 10 to 14 blooms, and come with individual water vials. The flowers measure approximately 3.5 to 4 inches in diameter. The arrangement above was created with 4 stems of freshly cut Cymbidium in our classic french milk jug vase (11.5"H x 3.8"W). Each purchase includes care instructions and an exquisite gift card for your personal message.